Home » The only side I need. The only side I need. Before elections in India, local politicians will go around with their contractors spot-fixing roads, drains, bribing locals with modern conveniences and money and more recently – as is the trend – building pavements along the side of the road which never seem to be 100% complete. Haste makes waste and all that. Everyone knows the game and why its being played. Votes. That heady mixture of cynicism and concern was one of my favourite things to witness when I was younger. My parents would never tell us whom they voted for and just like “they are all crooks*”, the secret ballot stayed a secret. As a child, I was so annoyed by this. I appreciate this lesson in suspense more as an adult. Not only did it keep the mystery alive, it allowed me to form an opinion of my own on who I thought would best serve my constituency. What India does have is a great democracy. It is the world’s largest and voting is made accessible and easy to everyone. It is declared a holiday and people are encouraged to go and vote. We even have a “0” vote or vote of protest, where you can use your vote to show that you have no faith in any of the candidates. All of these simple steps are put in place just so people can participate in what is one of their most important constitutional rights. It’s easy to take all of this for granted until you see them given provisionally even in a country like USA. I had no idea. You’ve heard all you’ve wanted/needed to hear about the election last week so I’m going to spare you my 10 cents so I can use it more productively, as they say in this land (do they say that?) What I will say is simply this: You have to care. I’ll be back with potatoes soon. My very recent history with the American Thanksgiving holiday is quite sad. How do you make things taste a certain way when you’ve only tasted them a handful of times? I’ll probably create my own set of what’s traditional and bring that to the table so when I say “it smells like Thanksgiving”, it’s probably going to be a plate of potato chops, xacuti and this dressing. Through much trial and error, I know the one TG-y food I will always want to make during this time of the year is dressing. When I first figured out what it was, I made it for a week straight. 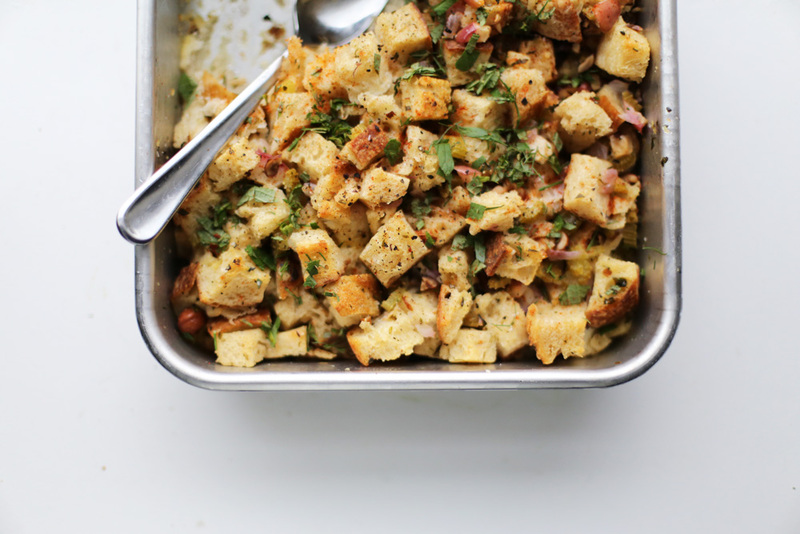 It’s bread salad that’s *this* close to being bread pudding and most importantly an eggmobile for breakfast next day. 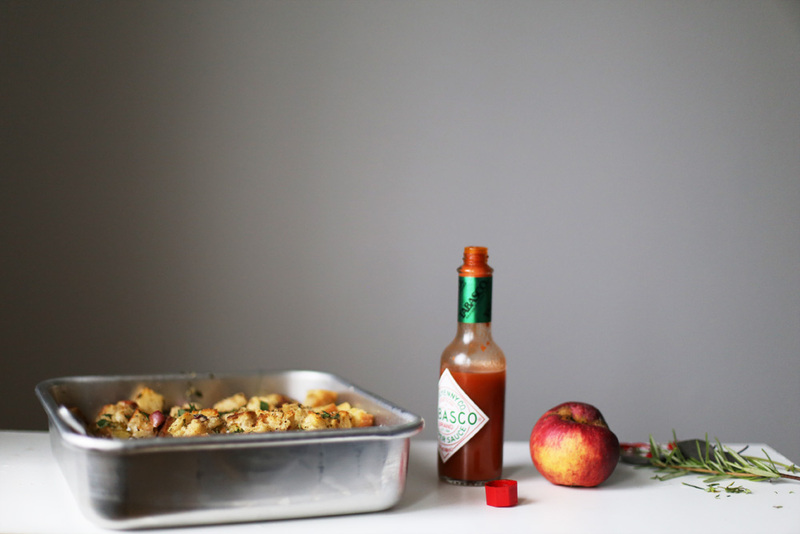 My one note for this recipe is a gentle reminder to break all the rules. There are so many types of breads you can use that is local to your part of the world (hi, Goa). As long as you form a strong base as I have with the butter, onion and celery (also ingredients you can switch up), you can add so many spices, greens, meat you name it. If you want to add ground meat, brown it first and set it aside in a bowl. After that continue cooking the recipe like I have in the instructions below. A large fistful of fresh herbs, roughly chopped. Mine included 3 tbsp of sage, 2 tbsp of rosemary, 1 tbsp pineapple sage 1 tsp of thyme and 1 tsp of tarragon. Set the cut/torn bread out on a baking sheet the night before and let it sit on your kitchen counter, exposed to all the air. This staleness will help the bread soak in the moisture through every crumb. If you want to skip this step, please see the note below*. 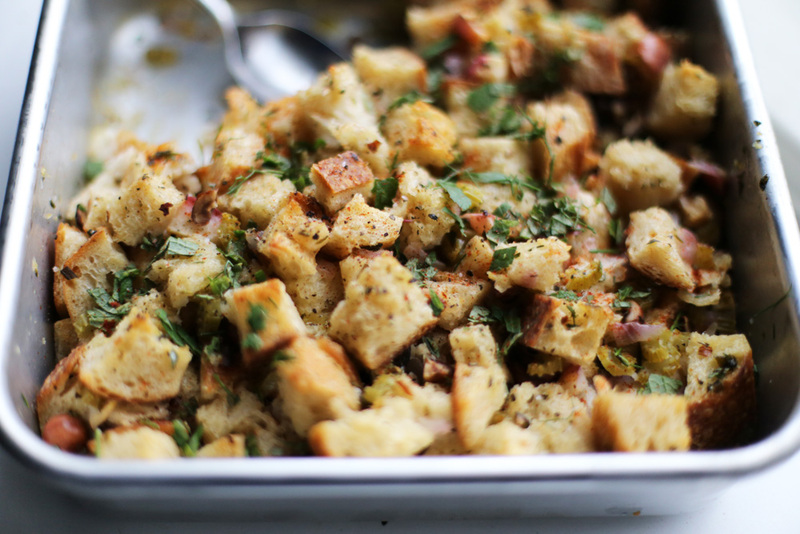 Place the bread in a deep baking dish. On the next day, pre-heat the oven to 350 degrees F. Melt the butter on medium heat in a large pot and once it’s hot, add the onion and celery to it. Cook for 5 minutes, stirring occasionally. Add the apple to the mixture and let it cook for 5 more minutes. The onions should have browned lightly and the celery should be tender. Add the salt, paprika and pepper and the chopped herbs and stir to mix it all together. Add 1 cup of the stock to the pot, give it a big stir and then pour this mixture on top of the bread in the baking dish. Using your hands, toss the bread well with the vegetable mixture so that every crevice has a happy helping of vegetables and herbs. Add the beaten eggs to the remaining 1 cup of chicken stock and pour this mixture over the bread. The bread should be so soggy that it falls apart but know that even if it does (because we’re human), it will taste delicious. Cover the baking dish with foil and put it in the oven for 40 minutes. At the 20 minute mark, remove the foil and let it continue cooking until it looks set and the top is nicely browned and crisp. Serve with hot sauce and top with more herbs if you like. *If you don’t feel like cutting and setting the bread on a baking sheet to dry out a day in advance, heat the oven to 250 degrees F and let it sit in for an hour. Toss it occasionally so it toasts evenly. I’m so glad I get email alerts for everything new you add to this space. This recipe sounds so delicious. My oven is busted so I’m waiting to get a new one before I can try making the recipes I’ve been drooling over. ???? I tell everyone to sign up via email so I’m glad that you did it. This tastes very good with roast chicken or with so gravy over it so if you do make something like it, do that. I can connect with soo much of this..the intrigue..watching parents go out to vote and return with their inked finger but not telling us who they voted for, contrast that with people putting up their ballots on Facebook over here. The sanctity with which I regarded my first vote, and the realization now that some of those rights (like paid leave to vote, again) aren’t a given everywhere, even in USA. The recipe I might take a pass on this time, but I’m here equally for the writing as well. Of course. If only people treated every gathering as a festival like we do in India. 🙂 Thank you for your comment. I feel most happy hearing from you, even if you don’t make the recipes. I don’t mind at all.